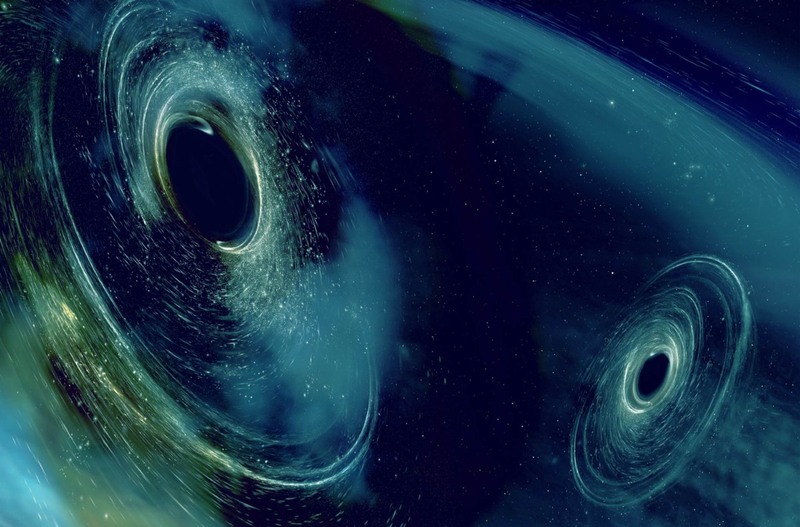 Enlarge/ Artist’s rendering of two merging black holes, producing telltale gravitational wave signatures that were picked up by the LIGO/VIRGO detectors..
At a weekend workshop in Maryland, physicists from the LIGO and Virgo collaboration reported four previously unannounced detections of gravitational waves from merging black holes, including the biggest-known black-hole collision to date, roughly 5 billion years ago. That merger resulted in a new black hole that is a whopping 80 times more massive than the Sun. All four are part of the first official catalog of gravitational wave events (called the Gravitational Wave Transient Catalog, or GWTC-1), listing all events detected to date. Their addition brings the total number to 11. Two scientific papers on the new findings have been posted to the arXiv preprint repository (here and here), pending publication. LIGO detects gravitational waves via laser interferometry, using high-powered lasers to measure tiny changes in the distance between two objects positioned kilometers apart. (LIGO has detectors in Hanford, Washington, and in Livingston, Louisiana. A third detector in Italy, Advanced VIRGO, came online in 2016.) On September 14, 2015, at 5:51am EST, both detectors picked up signals within milliseconds of each other for the very first time—direct evidence for two black holes spiraling inward toward each other and merging in a massive collision event that sent powerful shockwaves across spacetime. 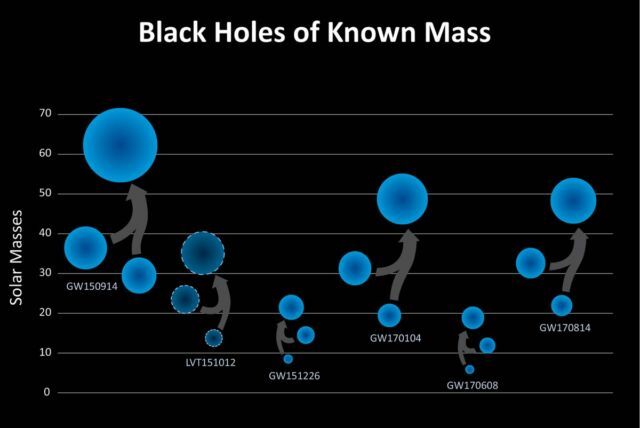 Enlarge/ This chart shows the masses of the black holes detected so far using gravitational waves. If the new events are from the same second runs as events previously reported, why are we only hearing about them now? It’s because the physicists wanted to make absolutely sure they were bona fide detections. “We’ve been sifting through the data, looking at every feature, comparing it to our astrophysical predictions, cross-checking it against monitors that tell us the health of the instruments, determining if it appears in all the detectors, and using our most robust (but slow-running) super-computer analysis codes,” Shane Larsen, a Northwestern University physicist and member of the LIGO collaboration, wrote on the Write Science blog. All that hard work paid off with the discovery of GW170729, GW170809, GW170818, and GW170823, referencing the dates on which the black holes were detected. “Having a collection of events is how we learn things about the Universe that can’t be learned from just a few observations,” Larson wrote. Among the things scientists have learned so far: the black holes involved in the mergers so far were formed from stars 45 times lighter than the mass of our Sun. That can tell scientists something about how black holes form and grow together, which can in turn yield insights into the evolution of stars.